Condensation on windows occurs when the surface temperature of the window is low and the interior of the room is warm and has high relative humidity. Condensation isn’t caused by the window system itself, but rather by the humidity caused by lack of ventilation in the room. Condensation can cause damage including wallpaper peeling, moisture patches on walls and in some cases even streaming windows. If left untreated, condensation can lead to mould growth, which can be potentially harmful and lead to health issues. So how does condensation form? Relative humidity is a function of moisture in the air and temperature. Warm air holds more moisture, which means if a window is colder than the surrounding air, the moisture in the air condenses when it comes into contact with the cold surface. The colder the outdoor temperature, the more likely you are to have condensation. Windows are usually blamed because they are the first place condensation can be seen, but they are typically a warning sign moisture has also gathered between the walls and in the insulation. A small amount of humidity is necessary for comfort and health and a little fog on the windows now and then shouldn’t bother you. 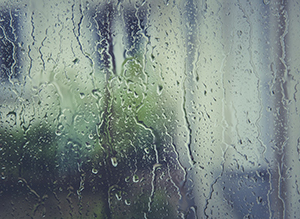 Problems occur when condensation covers the entire window and drips down along the walls. What do you do when condensation forms? The best way to control condensation is to keep the relative humidity low. When there’s too much condensation it means that humidity is too high in your home. There are several ways to combat condensation and prevent it from occurring in the first place. Vent clothes dryers to the outdoors where possible. Moisture being removed from clothes can flow into the rest of the house. Alternatively keep windows and doors open during the cycle. Use bathroom exhaust fans during and after showers and baths, and ensure they are vented externally and not just into your roof cavity. Open windows and ventilate for short periods of time in any room with condensation. Air out the kitchen, bathroom and laundry during and after use by opening a window for a few minutes. Use a fan in short cycles within a room when the problem is excessive or use the dehumidifying setting on your air-conditioner. Wipe down wet surfaces and keep windows and walls as dry as possible. Make sure your windows are correctly and adequately sealed. For additional prevention, consider high performance and energy efficient windows that not only reduce energy costs but also make homes more comfortable. The Southern Star Group offers a rage of high performance windows with a variety of glazing options and high performance seals. Visit a showroom or our website for more information.